A recent Rolling Stone article by Matt Taibbi, entitled Everything Is Rigged: The Biggest Price-Fixing Scandal Ever , reveals that the biggest banks in the world are still involved in collusion and price-fixing at a grand scale, including a $379 trillion market for interest rate swaps. This informal audio recording from a THRIVE Team conference call takes a deeper look at this story and what we are doing to overcome the rigged economic system. Claire sent me, and several other people have as well, the article by Matt Taibbi from Rolling Stone, who’s been doing an excellent job of really researching a lot of the financial scams. He’s in New York and he’s got a lot of contacts, he tracks stuff down, and he really gets the information. So, it’s not just speculation. He comes out with the data and talks to people involved and so forth. It was very heartening to see him lead off this article with this quote: “Conspiracy theorists of the world, believers in the hidden hands of the Rothschilds and the Masons and the Illuminati, we skeptics owe you an apology. You were right.” And then, he goes on to write a long, in-depth, well-written article about the next in a domino cascade of financial scams, which are getting exposed. Kimberly and I have been getting informed about this from our sources in high places for many months that this was going to be happening and when the Libor scandal got exposed a few months ago, that was the first kind of confirmation of what we’d been hearing. But, we were being told there was just going to be a whole cascade of corruption that was being exposed and it’s all linked together and, unfortunately, it confirms the types of things we described in THRIVE. 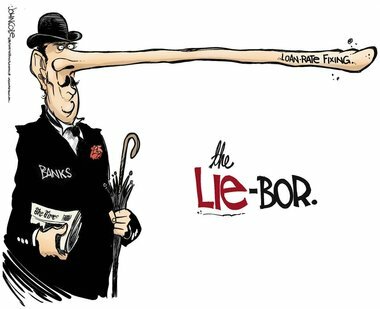 Just to refresh you, the Libor scandal was a situation where at least three and as many as 16 global banks were incriminated, were accused, of having rigged this Libor platform. Libor is a panel that sets global interest rates and it’s supposed to be simply a recording of data of different information all over the world that then gets averaged and sets the price. That would happen in an honest, true free market where prices were real, but any chance that the global bankers get to fix anything that’s going to accrue to their financial benefit, they’re not apt to pass it up and Libor was a good example of that. In the Libor process, they were fixing the prices of upwards of $500 trillion worth of financial instruments and, so, it’s corruption at the most fundamental level. It really affects virtually everyone in the world when they’re rigging these prices rather than letting them be natural. When the Libor players were accused, there was a lot of news that came out about that, but what actually happened (as usually happens) is that there was a minor wrist slap and Barclay’s Bank got off with a relatively minor fine in the $450 million range, UBS paid $1.5 billion, and RBS paid $615 million. Compared to what these banks are making, that is the kind of change you’d find in their couches. And, actually, no individual was ever threatened with criminal prosecution in this. Basically, this is a green light to all the bankers saying, “OK, they’re going to let us do this. We may have to pay some fees occasionally as we go along, but we’ll make billions and hundreds of billions if we continue to do it.” So, they’re continuing to do it and the most recent one that’s being exposed is a London-based firm called ICAP. (I’m not sure what ICAP stands for and I can’t find it anywhere, even on their own website.) Anyway, it’s the world’s largest broker of interest rate swaps. So, there are interest rates, which were being rigged by Libor, and then there are interest rate swaps, which are basically just deals that speculators do to try to hedge their bets and, actually, the truth of the matter is, to make money on insider knowledge. They’ll bet on whether or not the interest rates will go up or down and then, when they swap those bets, that’s the interest rate swap. But whether you know the interest rates are going to go down, it’s a lot easier to have successful bets. It’s like rigging a football game or something like that. If you know the outcome, it’s a lot easier to make money and a lot of people get screwed in the process. So, this is exactly what they’ve been doing. And this is a $379 trillion market and that means that any manipulation by this corrupt group would affect assets approximately 100 times the size of the United States federal budget. So, this is a big deal and it’s just one of many. And, it’s the same players you would expect: it’s Barclay’s, UBS, Bank of America, JPMorgan/Chase, Royal Bank of Scotland. Those are the ones we know of so far. Matt actually acknowledges in his article that this is a single, giant, mushrooming conspiracy of collusion and price-fixing. It’s really a conspiracy on top of a conspiracy, so they’re rigging both the rates and, then, the swaps. Matt compares it to a really good analogy. It’s as if you’re going to bet on the horse races and there were two sets of stands and half the stands had a curtain in front of them so you couldn’t actually see the race — you had to wait until the results were in. But the other half could see all along the way, so they could make bets on what was actually happening. Except the people in the stands where the results are concealed aren’t told that that’s what’s happening. What they have done is that they’ve rigged this so that they delay the reporting and then inform the brokers who are on the inside so they actually know what’s happening so they can make their bets appropriately. So, then the question comes up, “Who loses when something gets rigged like this?” and it’s the same sort of people who got screwed in the sorts of credit default swaps that we described in THRIVE and also came out in the Libor scandal — it’s cities, it’s towns, it’s companies, it’s universities, it’s other significant investors, it’s mutual funds, and so forth, all of whom are making their investments based on the assumption of an honest system. But, it isn’t an honest system so, of course, the bankers get to benefit. And these [scandals] are, in fact, real, and you can simply go check it out. There’s no question whether or not this rigging is real. They’ve got hundreds of emails where they actually caught these people agreeing to give out these tips for a bottle of champagne or, in one case, a day-old batch of sushi. This is how expensive these tips are on the inside. At one point, Matt notes that one of the markets that might be rigged is the gold market and, of course, we’ve been saying that the gold market is rigged for many, many years, as is the silver market, and one of the key realizations is as is every market. Every major market, I believe we will find as this stuff comes out, is being rigged because there’s no reason that the people who do this would allow any major market to go unadulterated if they, in fact, can take it over — and they’ve been at this a long time. So when Matt describes the gold market, he says, “where prices are set by five banks in a Libor-ish teleconferencing process that, ironically, was created in part by N M Rothchild & Sons”. So, I believe that as you go back and trace the ownership of any of these banks, much less the Federal Reserve, Libor, and ICAP and so forth, you’ll find that who’s really running this is the same banking families that own the Federal Reserve: the Rothchilds, the Rockefellers, the Morgans, the Carnegies, the Mellons, and so forth. And that’s the key point: that we’re still seeing barely the tip of the iceberg and this is why the Western banking system is crumbling…because it’s being exposed and it’s why there’s over 500 hundred high-level banking resignations just in the last two years. People are literally taking their money and running for the shadows and trying to get out from under the kind of liability that, hopefully, will sooner or later happen. Meanwhile, what it points to is there’s a major re-boot of global economic systems that’s needed based on integrity, but also a major phase of truth and reconciliation where the people who’ve been doing this actually need to pay back a lot of this money to the parties from whom it was stolen and I think we’re just beginning to move into that era. It’s exciting that any of this is coming out in the mainstream because the whole strategy of trying to demean anyone who talks about this as a nutty, whacko conspiracy theorist, that’s really becoming very ridiculous, old-hat, and kind of fuddy-duddy for people to still try to claim conspiracy doesn’t exist in the world because billions and billions of lives are being destroyed by people in denial that conspiracy can and does exist. Something like this confirms for me even more what we’re doing with THRIVE, the Solutions Hub, and the upcoming ThriveTV — by exposing this information and really focusing on how we can collaborate on effective solutions is just the right thing for us to be doing.